Russian President Vladimir Putin (R) shakes hands with his South Korean counterpart Moon Jae-in during their meeting at the Eastern Economic Forum in Vladivostok, Russia, Sept. 6, 2017. 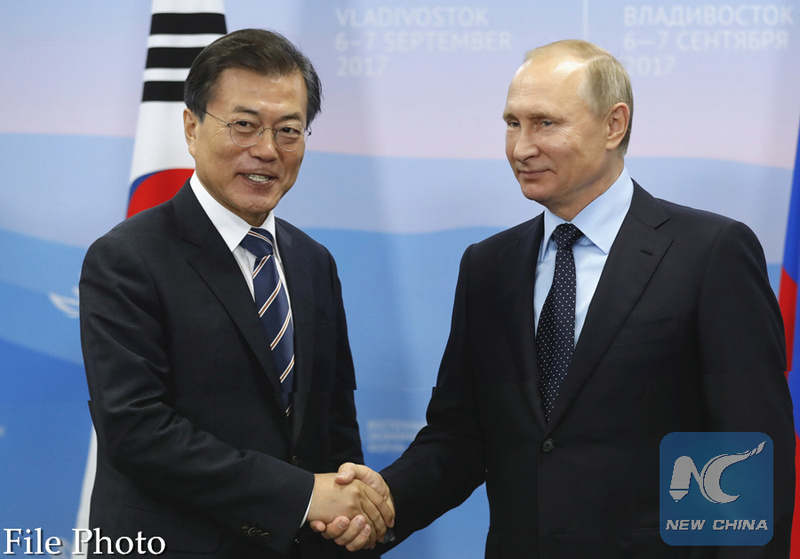 MOSCOW, April 29 (Xinhua) -- Russian President Vladimir Putin told his South Korean counterpart Moon Jae-in during a phone call Sunday that Russia is willing to promote cooperation between the two Koreas as Seoul and Pyongyang are seeking reconciliation. During their phone conversation, Moon informed Putin of the detailed outcome of his meeting with top leader of the Democratic People's Republic of Korea (DPRK) Kim Jong Un on Friday in the border village of Panmunjom, the Kremlin said. Putin and Moon positively assessed the agreements reached at the meeting, it said in a press release. The Russian president confirmed Russia's readiness to promote the establishment of practical cooperation between South Korea and the DPRK, in particular through the implementation of major tripartite infrastructure and energy projects. Putin stressed the importance of continuing the efforts of all parties involved toward a political and diplomatic settlement of the Korean Peninsula issue following a roadmap proposed by China and Russia. The roadmap suggests that the DPRK suspend its nuclear and missile tests and the United States and South Korea stop their joint annual military drills on the peninsula. It also proposes a dual-track approach involving the establishment of a peace mechanism while achieving denuclearization. Tensions on the peninsula have eased dramatically since the beginning of 2018, leading to the historic summit between Moon and Kim on Friday. The two leaders signed a joint declaration confirming the common goal of complete denuclearization of the peninsula while agreeing to multilateral talks to turn the current armistice agreement between the two Koreas into a peace treaty.